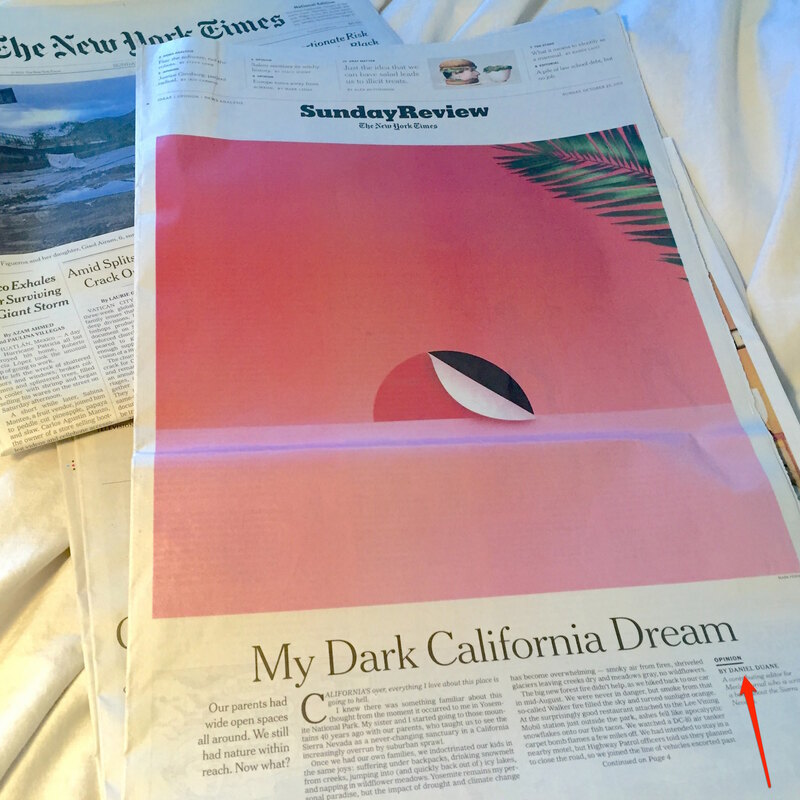 In case you missed it over the weekend, Bernal neighbor Dan Duane had a very prominent, very thoughtful piece about the fate of the California Dream on the front page of the Sunday Review section in Sunday’s New York Times. All over Northern California, there is a profound mood of loss: Oakland, long a bastion of African-American cultural life, has seen housing rental rates jump 20 percent this past year; San Francisco’s lesbian bars are closing, and the Castro gets less gay by the year. Then there’s the shock of raising kids with public schools ranked among the worst in the nation, and public universities that have more than doubled in cost since 2007. Most of my outdoor pleasures are still available, but it’s getting scary with the desertification of subalpine ecosystems, Sierra snowpack at a historic low, as much as 20 percent of California’s once-majestic forests at risk of dying, and freeway traffic so ubiquitous that it can be soul-destroying just getting out of town to see all this stuff. The real estate market, in the meantime, has become so bizarre that my funky little neighborhood is already beyond the reach of young doctors and lawyers — techies only need apply. This may sound like the stuff of yet another nostalgic lament about the unsettling pace of change in California, but Neighbor Dan is too self-aware to fall into that dead-end trap; He knows people have been writing “California is over” essays for as long as there’s been a California. Whoa. Here’s Neighbor Dan’s essay. Don’t miss it. 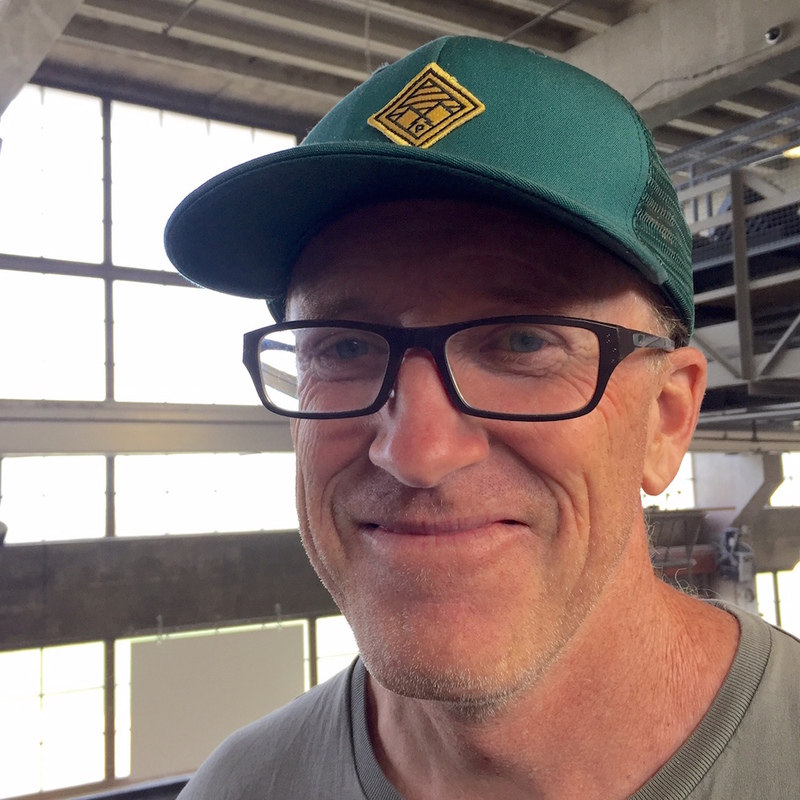 If you see Neighbor Dan out and about, we encourage you do the same. The “techies only need apply” slag cracks me up every time– my husband is a “techie” and has been for well over the time we’ve lived in Bernal, and certainly during the time we’ve had home offers rejected in favor of the ubiquitous out-of-town, all-cash offer. Hell, I was even in tech as well for a period of time when we’ve had offers rejected. Where’s our house, if being a techie is the core requirement? But, aside from that personal pet peeve, great article! Hey Todd, the “Here’s neighbor Dan’s essay” just links to his homepage (http://www.danielduane.com/Site/Home.html). As a public school teacher at SFUSD for past 20 years, I must take exception to the writer’s sprawling generalization of our city’s public schools as the worst in the country . I teach at a very successful school, and there are many similarly high quality, creative, good schools throughout the city. While I agree with some of other sentiments of the writer, he does need to careful about generalizing to try to make an effective point . Not even close. It makes me sick that someone would start with that as a working assumption. And then he backs it up with: absolutely nothing. BTW, good luck trying to substantiate that. The data says something else. BOO-HOO! Go away, Dan. First you’re wrong about the schools. SF schools have a good and well-deserved reputation. Second, “lesbian bars” haven’t been closing. ONE BAR closed. Third, the whole goal of the gay civil rights movement was to be able to assimilate, so that being gay was NOT an issue. SF is a success in that regard, not a failure! As for affordability, Dan equates “California” with the Bay Area. There are PLENTY of communities outside the Bay Area where the homes are affordable. I know a woman who makes hippie dresses and creates window displays who was able to buy her own house near Lassen Park. I can point to dozens of homes with acreage that can be bought for $100k or less. They’re not going to be in the Bay Area, but so what? “Our parents had wide open spaces all around. Now what?” Well, even though California’s population has doubled in size since the 1960s, to 34 million, there are STILL plenty of wide open spaces, and within an hour’s drive. My feeling is that Dan wants to grouse about something because it makes him feel a like a writer. Writers are always grousing about something. Why not flip the idea over and talk about how great California is? Well, no, negatively inclined people aren’t going to say anything positive because it’s not artsy enough. I think David’s comments prove Dan’s point, that each new generation lives their own California dream and it is a different one for each new one. Ask any of the old timers at the Wild Side West and they will tell you that lesbian bars are definitely disappearing and when I came out in 1973 in the Castro, I did’t want to assimilate; I reveled in my individuality. And as for the schools, tuition at SF State was $80 a semester. I am glad to see that this new generation thinks California is as great for them as it was/is for me. SF’s lesbian bars closed a LONG time ago. Maud’s Study (later just Maud’s) closed in 1989, that’s 25 years ago! Scott’s Pit closed in 1984 — 31 years ago! Peg’s Place closed in what, 1982? 1983? When did Rikki Streicher turn Amelia’s into the Elbo Room? 1989 or so? Why? Because she wasn’t making any money running lesbian bars anymore, and this was BEFORE the Valencia street boom. So, none of this was brought about either by the current tech boom or the one that ended in 2000. Secondly, as a longtime gay civil rights activist, co-founder of the Pacific Center, Gay Action, and a co-ordinator and publicity director of SF Gay Rap, I can tell you that the whole goal of gay civil rights organizing was to make being gay a non-issue. This means assimilation. And it’s worked. But today is today. El Rio is lesbian-owned, but it’s just not feasible to be a lesbian bar. Several bars are owned by gay men, but it’s not feasible to make them gay. The lesbian manager of the Eagle hangs out at the Powerhouse. The Beatbox on 11th, considered SF’s #1 gay nightclub, was managed until recently by a straight man, Nick Callahan.